Two uniformed NYPD police officers were shot dead execution style today December 20th while they sat in their police car on a Brooklyn street corner and investigators believe they were killed to avenge Eric Garner and Michael Brown because of what the killer wrote on instagram hours before committing the murders. 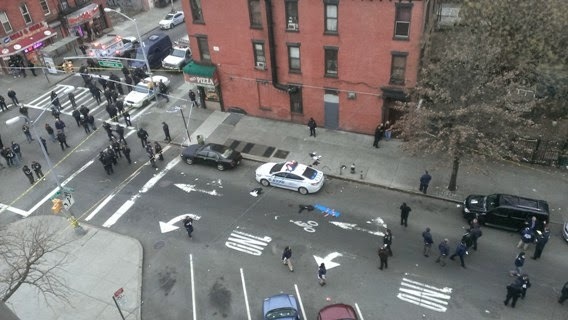 Scene of the shooting above. 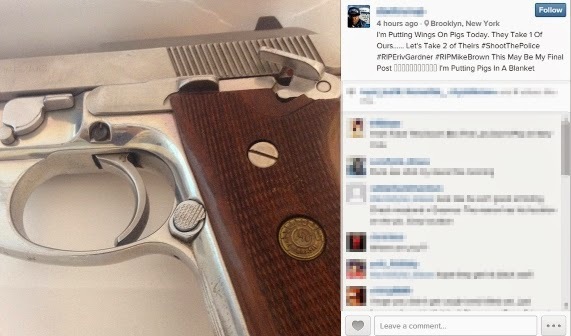 "I’m Putting Wings on Pigs Today,” a person believed to be the gunman wrote on Instagram in a message posted just three hours before the officers were shot through their front passenger window. The post included an image of silver automatic handgun with a wooden handle. 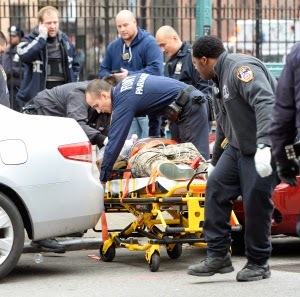 Another post showed camouflage pants and blue sneakers which matched the clothing the dead gunman was wearing as his body was carried from the scene on a stretcher. “They engaged the guy and he did himself,” one investigator said of the gunman’s demise. Both shooting scenes — above and below ground — were scenes of blood and terror. 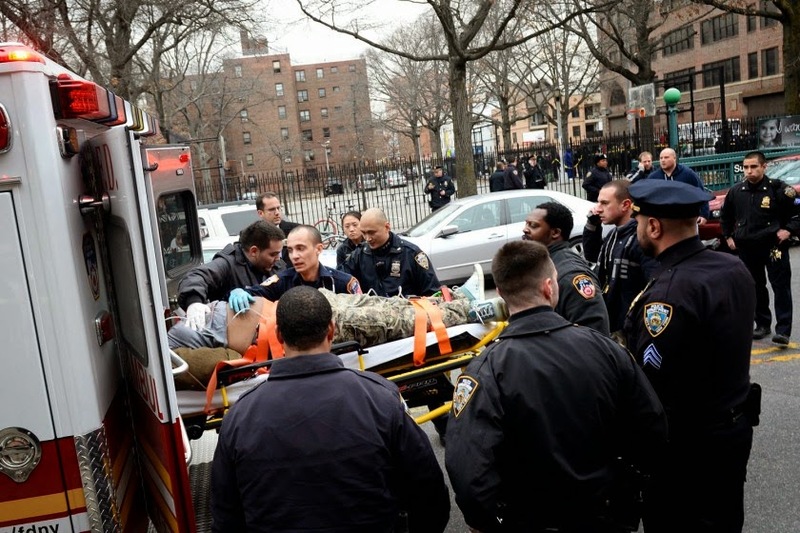 "I heard shooting, — four or five shots,” ear-witness Derrick McKie, 49, told The Post of the cops’ tragic murder. “It sounded like from a single gun,” he said. Ambulances and police cars rushed to the scene, he said. 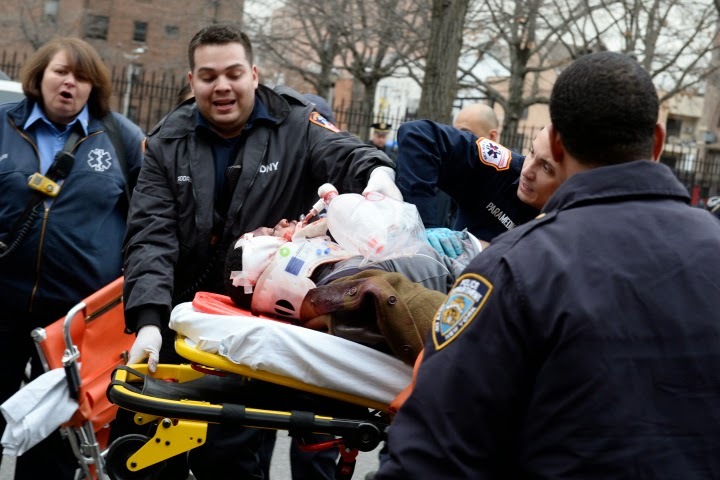 Modal Trigg Carmen Jimenez, 32, a social worker from Bedford-Stuyvesant, was on the subway platform when the gunman ran inside, pursued by officers. “Everything happened so quick,” said Jimenez, who is eight months pregnant. “We were standing waiting for the G train. We heard arguing from the other end of the platform. “We tried to get out of there, and there was a lot of shouting, people were screaming, people were trying to run.